Dedicated cardiac Cadmium–zinc–telluride (CZT) cameras show superior performances compared with Anger systems, particularly in terms of spatial resolution and count sensitivity. 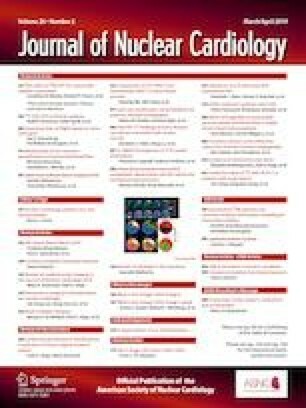 This study evaluated the performances of a new polyvalent whole body CZT camera (DNM 670CZT) compared with a cardiac dedicated CZT camera (DNM 530c) for myocardial perfusion SPECT. The spatial resolution was evaluated with three linear sources filled with 99mTc. We used a cardiac phantom to evaluate count sensitivity, sharpness index, contrast-to-noise ratio, wall thickness, non-uniformity index, perfusion scores and ventricle volumes for both cameras. The impact of matrix size, and acquisition time was investigated. Concordance between the two cameras was evaluated in patients using QPS/QGS software for quantitative segmental perfusion, motion and thickness scores. The spatial resolution was identical with the two cameras. Count sensitivity of the DNM 670CZT was twofold lower compared with the DNM 530c, leading to lower sharpness index and contrast-to-noise ratio. The wall thickness and the myocardial volumes were similar. Visual and quantitative assessments of the perfusion patterns have shown a good concordance of the two cameras on phantoms and in patients. This study demonstrated the feasibility of myocardial perfusion SPECT imaging using the new whole-body DNM 670CZT camera. The online version of this article ( https://doi.org/10.1007/s12350-019-01702-2) contains supplementary material, which is available to authorized users. The authors of this article have provided a PowerPoint file, available for download at SpringerLink, which summarises the contents of the paper and is free for re-use at meetings and presentations. Search for the article DOI on SpringerLink.com. We thank Pierre-François Quique and all the nuclear medicine technicians at Lille for their valuable support. No conflict of interest relevant to this article was reported.